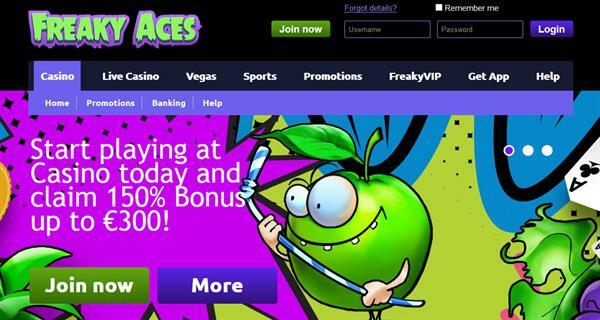 Freaky Aces Casino is a great new 2017 established casino, offering really a huge variety of games only from top software providers. Australian dollars, Canadian dollars, Denmark kroner, Euros, British pounds sterling, Norwegian kroner, New Zealand dollars, Swedish kronor, US dollars, Bitcoin . All bonuses have specific requirements that need to be met before bonus and all winnings become available for withdrawal. For deposit bonuses, gaming amount is required to be wagered 35 times in bonus eligible games while free bonuses are required to be wagered 99 times, unless stated otherwise in the promotional description. If bonus requirements are not spent during 7 days after bonus was activated, bonus will expire. Tip 1: Please be aware that maximum bet allowed during bonus play is 5 EUR/USD/GBP/AUD/CAD/NZD or 50 SEK/NOK/DKK. If upon withdrawal during the review of transactions it will appear that this term is breached, bonus and all resulting winnings might be void. Tip 2: Re-starting unfinished game rounds in bonus video slots after bonus was lost or expired is viewed by Casino as bonus abuse. All resulting profits from unfinished game rounds that were started during bonus play will be void prior to withdrawal.